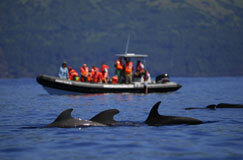 The last sperm whale was hunt in 1987, in Lajes do Pico. 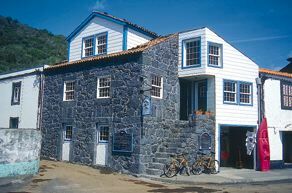 Espaço Talassa was sprung in 1989 from the meeting between a former whaler "João Vigia" and a sailor "Serge Viallelle", put in at the archipelago. 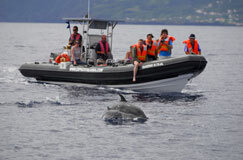 The first Azores plan for the protection of sea environment and for the education of the public, called "dolphins, whales and men" and descending from their mutual passion for the sea, began to take shape in 1991. The BOCA (Observation Base of Cetaceans from Azores) opened in 1995 onto the Lajes do Pico port, just close to the Whalers Museum There you can find documentation about the archipelago and the cetaceans that live in the Azores waters but also a specialised library, a video one, the statistics resulting from our whale watching observations and finally information about the different research plans in progress. 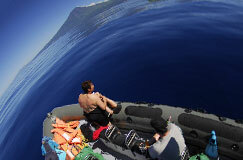 In the shop you can rent kayaks, mountain bikes and a briefing is offered every day. Local crafts that you can find there are made with an alternative material and not with animal ivory. Admission is free. Look out posts : The "vigia da Queimada"
In order to pick out the animals, our whale watching boats are equipped with underwater microphones but we use mainly former whalers' services that are posted in observation towers called "look-out post". Thanks to a radio, those "lookouts" point out the presence of animals, their position, the importance of the groups but also the state of the sea… They are guarantors for our security. 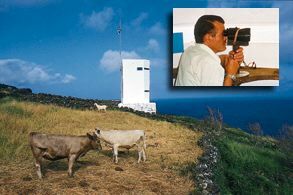 The look-out post of Queimada, which was closed in 1984, regained its original vocation in 1991: that is to say watching the ocean, being on the lookout for the breathing of the "sperm whale king". By the way, our whale watching trips cover some 50 miles from the east to the west and 20 miles from the north to the south on a 200 degree radius. The look-out post of Queimada is the only one in the archipelago that has 2 levels, what is for dolphin and whale watching fanatics an ideal tool. Visitors, mainly students or scientists who are interested in watching animals in their natural environment use the first level from May to October. They are assisted by experienced lookouts posted in the second level. 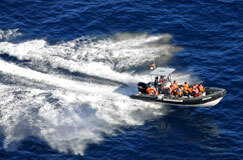 Espaço Talassa is equipped with 4 semi-rigid-type-boats 29 feet long. 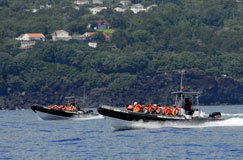 We favoured these boats in the concern to offer you security and comfort. Their small size and the engines used assure a minimum impact and so the well being of the animals. Their speed allows us to have a quick access to the observation zones and so to spend more time with the animals. 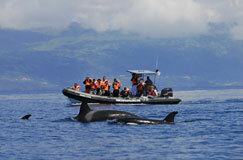 The choice of these boats is based on more than 20 years of whale watching experience in the Azores Sea.